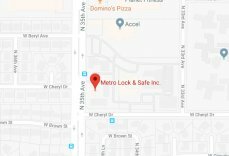 Car Security Features and Benefits | Metro Lock & Safe Inc.
Posted on February 5th, 2013 by Metro Lock & Safe Inc.
Buying a new car can be an exciting adventure. There are many new and exciting possibilities to consider from music and media options to seat warmers and towing packages. There is also an overwhelming sense of responsibility to make sure you get the basic features to fit your needs. Do you need extra room for car seats and groceries? Are you looking for a vehicle that gets excellent gas mileage or are you possibly considering an electric hybrid vehicle? It is important to consider these basic requirements and the fun “extras” you will add to your vehicle. Additionally, one of the most important things to consider is the safety features of your future vehicle. Did you know that future car companies may be able to make a vehicle that recognizes your DNA? The idea behind this is to virtually stop car thefts by not allowing a vehicle to start unless it recognizes your DNA! The idea may sound impossible but the opportunity is definitely there. As for now, there are some vehicles that come with finger print locks which hopefully would deter would-be-thieves from trying to steal your car. Keep in mind, however, that a thief may also resort to other measures in order to steal your vehicle (i.e., breaking your window). If you accidentally lock yourself out of your car, a locksmith can easily help you get back in. Many professional locksmith companies can get your vehicle unlocked within a matter of twenty minutes. If you need an additional set of keys for your spouse or children, a locksmith can duplicate your keys at an affordable price (not sure how the futuristic DNA model would accommodate additional drivers!). If someone did try to break into your vehicle and damaged either the door lock or ignition, a locksmith can help repair and re-key your vehicle. When trying to determine what type of car security features you need, consider the locations where you will be driving and parking your vehicle. If you consistently park your vehicle in a covered garage, then costly car security features may not be of the utmost importance to you. However, if you there is a high probability of your vehicle being stolen, you may save money in the long-run by purchasing a car security package.